Libraries from Texas to Philadelphia are opting to install kiosks where library patrons can download ebooks, but the Orange County Public Library is going school. The Daily Tarheel reports that the OCPL has installed a $180,000 library kiosk near the Cedar Grove Community Center. 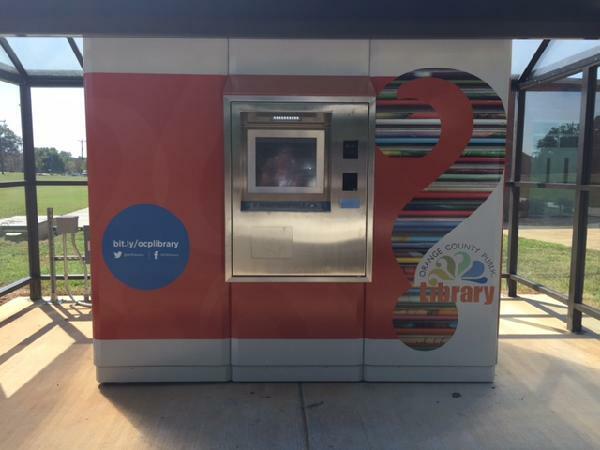 Larger than the average ATM, the kiosk offers 24/7 access to more than 250 books and DVDs. The idea for the kiosk came after Library Director Lucinda Munger saw a prototype of the machine at a library conference. She still wanted to offer library services to the area after a small library branch in Cedar Grove was closed due to limited usage and the need for building repairs. Other libraries, including one in Toronto, have installed similar machines. I have likened them to a better buggy whip in the era of cars, and I stick by that opinion. It would be more cost-effective to make an investment in a digital kiosk which let you download ebooks. Not only would it have a lower installation cost, the operating cost would only be a fraction of the $40,000 the OCPL is spending on their newest branch. Always interesting when I hear local news from a national source first! I have to agree that I don’t think this is the best use of that $40,000, although I disagree that an e-book kiosk would have been better. Cedar Grove is a rural farming community without great access to the internet (you’re lucky if you can get 6mbs/DSL from AT&T, otherwise you’re using HughesNet), and the old library branch provided a pretty vital service for providing computers and high-speed internet to people roughly in their neighborhood. Now, it’s a 10-20 mile trip to the nearest library for these services. Giving this community easier access to physical materials is great, but it’s quite a bummer that the materials are neither discoverable nor requestable. So if I wanted something specific, I’ve still go to drive to a real branch to get it. Or maybe I’ll drive 10 miles to hope it’s my “lucky day?” Probably not. It sounds like a better use for the funds would be to support some type of community center in the area. That would be a way to provide computers and internet access. Or maybe roll the funds into the budget for the bookmobile, and then send that through the area on a daily basis? That would give readers a chance to request books and get them in a few days.